WCHA Trophy Honors Sauer - College Hockey, Inc. Tournament teams to compete for Jeff Sauer WCHA Championship Trophy. Jeff Sauer is the WCHA’s winningest head coach. As the WCHA men’s tournament gets underway Friday, teams will be competing for a new trophy honoring a great friend to the college game whose association with the league spanned six decades. The WCHA unveiled the Jeff Sauer WCHA Championship Trophy on Wednesday, to be awarded each season to the WCHA Postseason Tournament Champion, beginning with the upcoming 2018 League playoffs and championship. 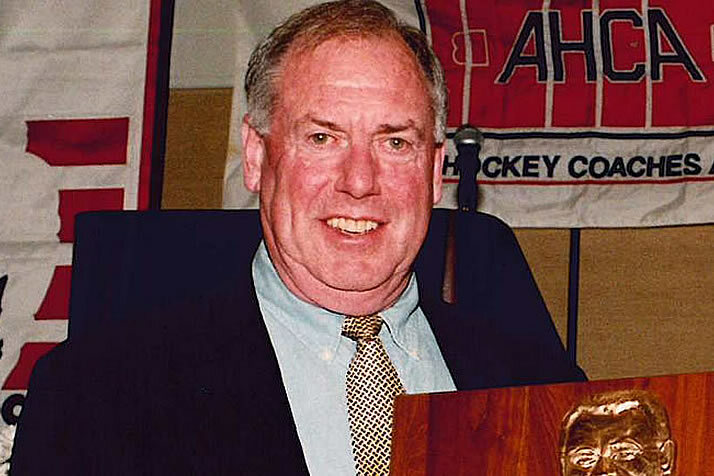 Jeff Sauer’s association with the WCHA spanned six decades, beginning with his playing career at Colorado College in the 1960s, continuing through 31 years as head coach of the Tigers (1971-82) and Wisconsin (1982-2002), and for 14 seasons (2003-17) in various consulting capacities to the Commissioner and Association Office. The only WCHA head coach with 30 years behind the bench, he is the league’s all-time winningest coach with 665 victories – the 10th most in NCAA men’s hockey history. A two-time WCHA Coach of the Year, Sauer guided his CC and UW teams to a pair of league regular season titles and six WCHA playoff championships – the league pinnacle for which teams will now raise a trophy in his honor. Additionally, Sauer coached in 12 NCAA tournaments, advancing to the Frozen Four on three occasions and winning the 1983 and 1990 national championships with Wisconsin. The new, custom-designed, perpetual Jeff Sauer WCHA Championship Trophy is presented by Anderson’s Pure Maple Syrup. The trophy, designed by renowned manufacturer Jostens, will stand more than two feet high on its own (and more than three-feet high upon its perpetual base) and will weigh approximately 46 pounds altogether (about 30 without the base). The hockey stick uprights are solid, brass-plated in 24-karat gold, while the rest of the trophy is produced with a mix of metals and aluminum accents, around a polished steel bowl. In the center is a bronze-cast medallion plated in gold with the name “Jeff Sauer” to symbolize the trophy’s namesake. The octagon-shaped base is made of the same materials and features nickel silver plates for etching the history of past winning teams. Sauer, who also spent nearly four decades with the American Hearing Impaired Hockey Association (AHIHA) and coached the U.S. National Sled Hockey Team to gold at the 2014 Paralympic Winter Games, was inducted into the USA Hockey Hall of Fame in 2014 and into the UW Athletics Hall of Fame in 2016. He also collected the Distinguished Achievement Award from USA Hockey in 2000, the John “Snooks” Kelly Founders Award from the American Hockey Coaches Association in 2004 and the Lester Patrick Trophy from the NHL in 2011. Sauer also was inducted into the Wisconsin Hockey Hall of Fame, Wisconsin Athletic Hall of Fame, the Colorado Springs Sports Hall of Fame and the Colorado College Athletic Hall of Fame. Previously, the WCHA awarded a version of the Broadmoor Trophy, which had been with the WCHA since 1981 and given to the league’s postseason champion annually since 1985. The trophy, which was redesigned in 2010 to resemble the Broadmoor hotel in Colorado Springs, will be retired.